As the holidays descend upon us, so do the holiday movies! Enter Netflix’s latest The Christmas Chronicles. “Who would have thought Kurt Russell would make such a great Santa Claus?” said someone who has never seen a Kurt Russell film! Kate (Darby Camp) and Teddy Pierce (Judah Lewis) are siblings who have recently lost their father. They don’t spend much time together like they used to. Perhaps it’s because of their age difference, and likely the loss of their dad. So when Kate propositions Teddy to help her catch Santa (Kurt Russell) on video in exchange for not showing their mother (Kimberly Williams-Paisley) video evidence of Teddy’s grand theft auto, he agrees. 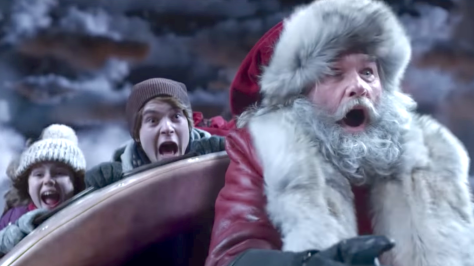 Not only do the two catch Santa in the act, they wind up going for a wild ride over an entertaining night with Santa Claus himself in an effort to save Christmas. Yes, it’s the sappy theme you’d expect, but with a modern edge that makes it fun for the entire family! Imagine all the great Kurt Russell quips that you’ve heard and swag you’ve seen in his work history applied to the role of Santa. He’s you’re cool grandpa that knows everyone he comes in contact with. Part of what sells this version of celebrating the Christmas spirit is the look and wardrobe of Santa Claus. In fact, the running joke of the film is how he’s not a fat and jolly old man. Instead, his slimmer physique and Russell’s signature delivery with dialogue, makes for a believable, more youthful Claus. Claus’s suit is the red and white we’ve come to recognize, but has a brown tint in the white fur. It’s a befitting look for a unique Claus. The visual effects team works magic in this film (minus the obviously CGI elves) as a floating sleigh looks authentic, Santa vanishing into mystical dust, and reindeer flying all look grounded in reality. Perhaps drawing on his animation experience and having director Clay Kaytis (his second time at the helms since 2016’s Angry Birds Movie) directing a film that relies on it’s visual effects and animation was a good move. The Christmas Chronicles is a solid pick for family viewing this season. With solid performances from its cast, the intrinsic entertaining magic of the season is baked into the script from Matt Lieberman. Plus, finding out who Mrs. Claus is will be a treat for movie geeks. So grab the kids, some cookies and milk, and have a nice night on Netflix.